Home » Interests » Beaches » Leave Only Footprints: It’s not a motto, it’s a mission. Leave Only Footprints: It’s not a motto, it’s a mission. 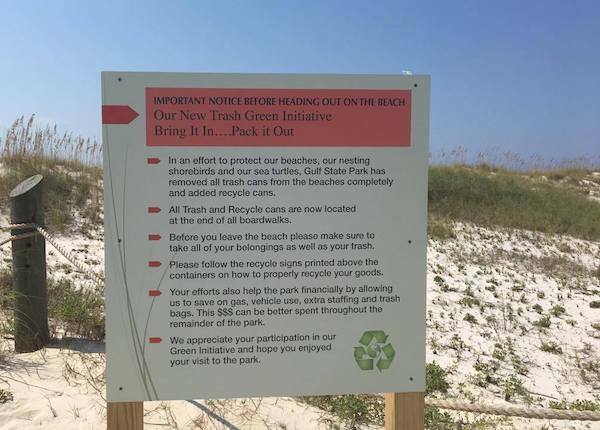 When Gulf Shores and Orange Beach invited me to learn about their Leave Only Footprints initiative, my first thought was sure. I mean, who says no to the beach? And, I figured it would be easy to write about their clean up efforts. I like eco-tourism. So I went to the beach — fully intending to do my part and leave only footprints and write a sweet little environmental article to inspire people to clean up their trash. Easy peasy. At the beach, I met lots of people. As I was leaving my condo one morning, an older couple and I chatted about restaurants and beach trips. They were celebrating their anniversary, a little surprised that I was there alone. 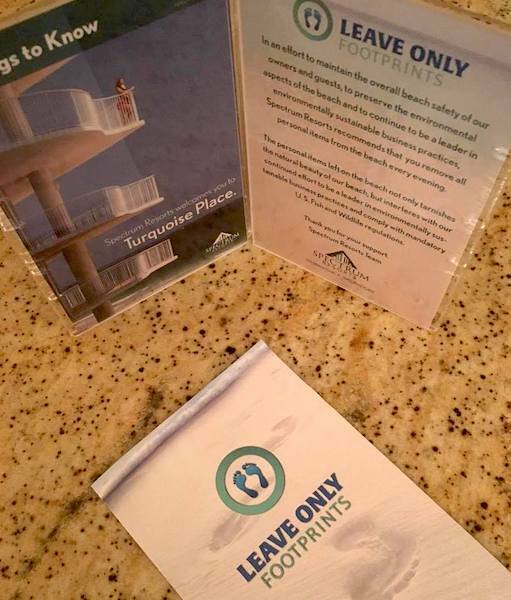 I asked if they knew about Leave Only Footprints, to which they replied they’d seen the flyer about it in their suite. Other than picking up trash, they didn’t know more. 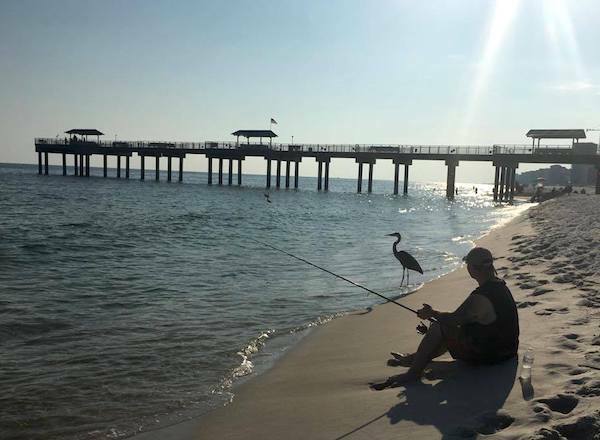 I asked some fishermen, who had befriended a blue heron by sharing their bait fish, if they had heard of Leave Only Footprints. They nodded and pointed, saying they’d seen the signs over by the pier. They assured me they’d pack up everything before they left. I wonder if they thought I was beach patrol. Teehee! In the parking deck, an enthusiastic surfer asked if I was having a great day, and then looked around and asked where my family was. I told him I was there to write about Leave Only Footprints and asked if he had heard about it. He said he saw the flags and that he always cleans up his stuff. He’d never litter, “it’s bad for surfing.” He did think it was “really cool” that Gulf Shores and Orange Beach are working so hard to protect the turtles, too. In my conversations, I quickly realized that people are aware of the Leave Only Footprints campaign, but only know a little about it. Kind of like me before I got there! So, what is Leave Only Footprints? 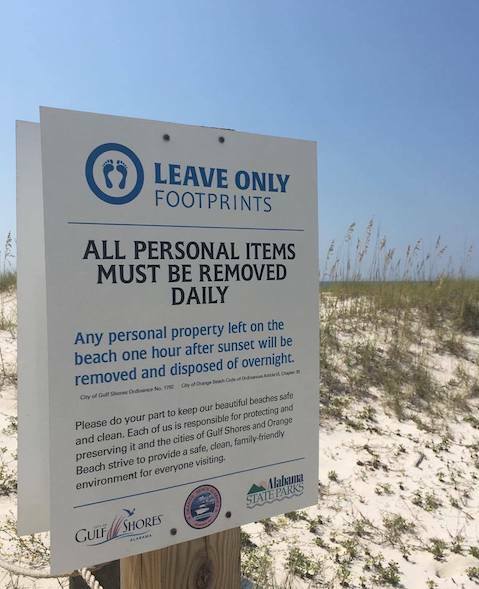 The purpose of Leave Only Footprints is to raise awareness and participation in green initiatives and encourage “leave no trace” behaviors by visitors and residents in Gulf Shores and Orange Beach. Efforts for this program began in 2007, coordinating city, state, business and individual efforts and resources to protect Alabama’s beaches. The message to “leave no trace” (aka, don’t litter) has definitely been heard. The many garbage cans and recycling bins placed on the beach make it easy to clean up before going home. But, there’s more to the initiative. Take it all home each day! 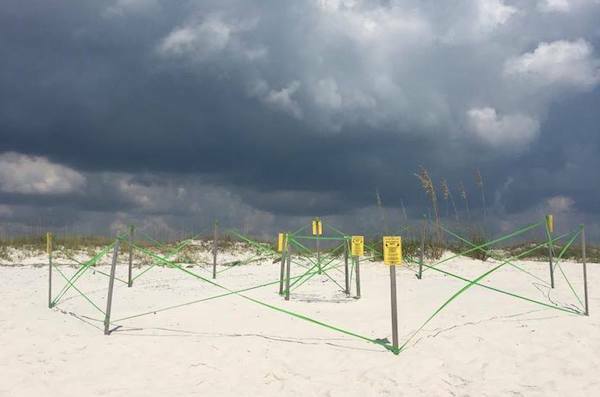 Chandra Wright, who works at Gulf Shores & Orange Beach Tourism with a special focus on sea turtle rescue, explained that vacationers used to come to the beach and “stake their claim” to a patch of white sand for the whole week. They’d leave up tents and beach chairs making it quite crowded. 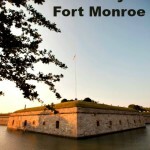 She added that the beach would get so crowded that emergency workers had trouble getting through in medical emergencies. She also explained that the sea turtles struggled because when they came ashore, they would often bump into an umbrella or tent pole and turn around and run back to the ocean. The clutter became dangerous to people and also threatened sea turtle survival. If people take their things home each day, it’s less cluttered overall — because you only stake your claim while you’re actually using the beach! Keep off the dunes. Sea grass and other vegetation in the dunes protects the beach. This delicate environment is home to all sorts of beach critters, too. When people walk through the dunes, they damage the dunes, the plants and the ecosystem, making the whole beach less healthy. Live environmentally. Local hotels and resort condominiums participate in ecologically friendly practices such as hanging towels to be reused instead of washing them daily, using energy efficient lighting, and encouraging guests to turn off lights when they leave their room. 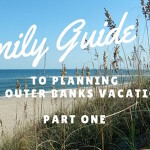 Riding bikes or walking instead of driving everywhere is another way to protect the environment — and with all the paths in Gulf Shores and Orange Beach, that’s very easy to do! 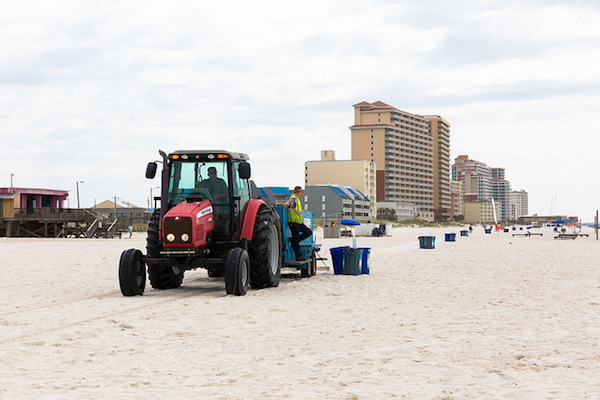 When residents and guests work together to keep Alabama’s beaches clean and healthy, this beautiful resource will be around for generations to come. Small choices every day make a big difference in reducing your overall carbon footprint — whether at home or at the beach. The Leave Only Footprints initiative challenges you to implement these simple “green” practices into your life. Obey the speed limit. The faster you drive, the more gas you use. Use BPA free refillable water bottles instead of disposable water bottles. The less plastic used, the less we dump into landfills. Choose a fuel efficient rental car. A key component of the Leave Only Footprints initiative is the beach clean up done each evening. An hour after sunset, beach patrols drive up and down Alabama’s beaches to pick up everything beach goers leave behind each day. So, if you leave that umbrella on the beach, it won’t be there in the morning. Use large umbrellas stored in bags with handles rather than a large canopy tent. Consider taking beach chairs with straps or or carry bags to make them easier to carry. Beach blankets and towels are also easy to carry. Consider a cooler with large wheels that’s easy to pull. If you’ll be at the beach all day, freeze as much as you can so things stay cold longer. Read this article for more great cooler packing tips. Insulated cups keep drinks cold longer — and unlike disposable water bottles, they don’t clutter landfills. NOTE: Glass bottles are not allowed at the beach for the safety of all beachgoers. Throw away all your garbage! Keep the beach clean for other beach goers and safe for the beach critters! Leave Only Footprints has been a success! In 2014, only 80 sea turtle nests were found on the beach. Last year, volunteers counted a record 237 sea turtle nests. But that’s just one measure — something tourists might not notice. And that’s when it dawned on me… One of the reasons I love visiting Gulf Shores and Orange Beach is precisely because the beaches are uncluttered. I can walk barefoot. I can always find a quiet stretch of sand. And I realized that while I really didn’t know about the Leave Only Footprints before, I had enjoyed its success! 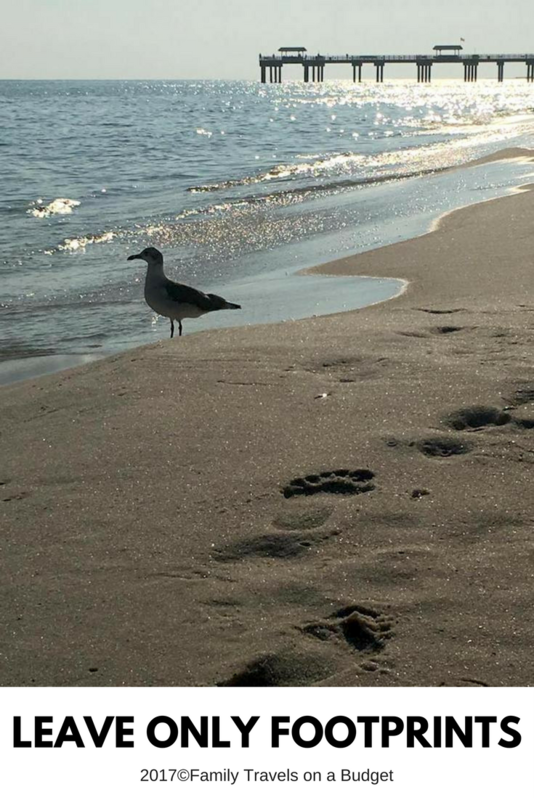 The Leave Only Footprints initiative is a success because of the partnership between local businesses, hotels and condominiums, the local government, the visitors’ bureau, Gulf State Park and guests who visit the beach each day! To learn more about Leave Only Footprints, visit their website. It reminds me of the Boy Scouts ethos: Leave no trace. Such a good thing to ingrain in everyone’s mind. This really is a great initiative. We really have to take care of our environment and unfortunately, some people don’t think twice about what they do. 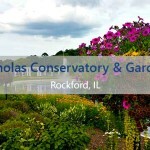 Great tips to help us at home, too. That’s a fascinating bigger campaign with pieces I hadn’t thought of. Of course… I wouldn’t ever dream of staking a claim and thinking it was “my” beach for my whole trip but fascinating on the holes, etc.